The bestselling author, Pulitzer Prize winner, and “America’s Historian-in-Chief” (New York), Doris Kearns Goodwin returns to Writers on a New England Stage with her latest work, Leadership: In Turbulent Times, a culmination of five decades of work in presidential history. 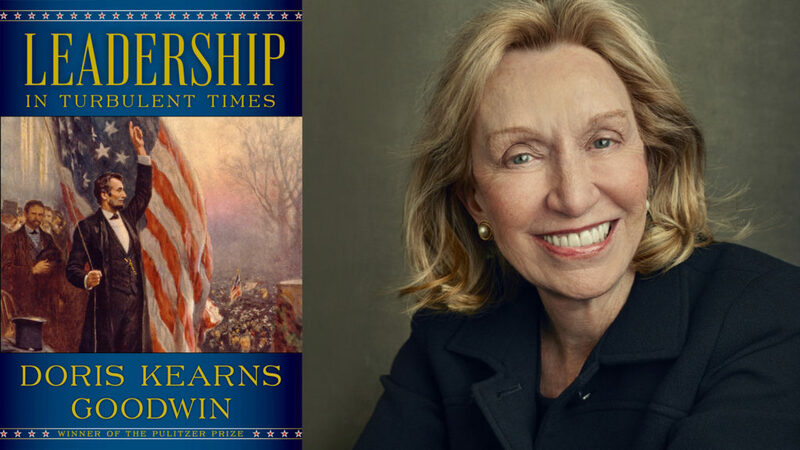 Combining her signature storytelling with essential lessons from four of our nation’s presidents—Abraham Lincoln, Theodore Roosevelt, Franklin D. Roosevelt and Lyndon B. Johnson—Goodwin shows how they recognized leadership qualities within themselves and were recognized as leaders by other. She explores their unique journeys as they navigated and grew through adversity, and she analyzes how they emerged to confront the challenges and contours of their times. In this revelatory work, Goodwin raises such thought-provoking questions as – Are leaders born or made? Where does ambition come from? How does adversity affect the growth of leadership? Does the leader make the times or do the times make the leader? Don’t miss hearing from this celebrated and insightful author about this important and timely topic. Doris Kearns Goodwin’s presentation will be followed by an onstage interview with Lauren Chooljian, New Hampshire Public Radio’s Politics and Policy Reporter. Lauren’s reporting focuses on the impact of politics and public policy on the residents of New Hampshire and beyond. Ticket package includes reserved seat and copy of the book (Leadership $30 hardcover).